Knowing how to clear cookies is pretty important for any number of reasons, be it for personal preference or troubleshooting issues with websites. You may be wondering how to remove cookies on a Mac running the Safari web browser, and that is exactly what we’ll show how to do. There are actually a few ways to delete cookies in Safari on Mac OS X, we’ll show you how to delete all cookies from Safari, and how to delete specific site cookies from Safari on Mac too. Keep in mind the cookie removal process is actually handled slightly different from version to version of Safari, with newer versions of the OS X browser app being a bit easier than old versions. We’ll cover both just to be sure, that way it won’t matter what version of Mac OS X or what version of Safari you’re using, you’ll be able to erase all cookies if you need to. Let’s get started, covering modern versions of Safari first. This works in all modern versions of OS X, including OS X El Capitan, Yosemite, Lion, OS X Mountain Lion, Mavericks, running Safari 8, Safari 5, Safari 6, Safari 7, and presumably any future versions as well. 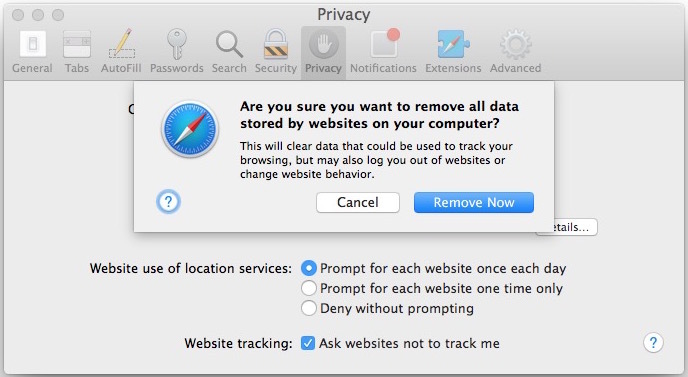 Mac users can also clear cookies from Safari by pulling down the “Safari” menu and choosing to ‘Clear Website History and Data’, which will also delete browsing history and other data. Older versions of Safari and older Macs can continue to use the method below, which is slightly different. That’s all there is to it, now your cookies are cleared in Safari. can you suggest me what to do? One of the things that I have found is if you want to move individual cookies the details button under preferences/privacy is not always there so it is difficult to be precise. I delete a cookie and it comes back almost immediately. I set ‘Always Block’, but it doesn’t. I changed the Cookies folder in Library to read only, but that hasn’t worked either. Surely, since this is MY computer, I should be able to say who and what is allowed in? If I want to ban double-click forever from my machine, surely that IS MY RIGHT? Any geniuses out there able to help with that? What i have noticed in researching this problem of cookies that won’t leave is, every site just tells you the regular routine… seems no one knows how to get rid of them.